Another week ends, which means it’s time for another Uncommonder article! This series highlights the unicorns of Commander: legendary creatures printed at the uncommon rarity, as opposed to rare and mythic rare. The series was inspired by Dominaria, which gave us 20 new uncommon legendary creatures. There have been quite a few of these silver commanders in past sets; some legendary creatures were originally released as rares, but over time have been shifted down to uncommon instead, so they now qualify as Uncommonders as well! So far, this series has covered two of these downshifted legendary creatures in the form of Zada, Hedron Grinder and Jalira, Master Polymorphist. For the record, YOU the reader can help decide which Uncommonder I write about each article! I get the Twitter poll options from my Praetor Magic Discord server and then I make a Twitter poll where you can double dip and vote for your favorite entry! Make sure to join me on Discord and follow me on Twitter if you want to help continue the series as we talk about the twenty Dominaria Uncommonders and twenty more from past sets and downshifted legendary creatures! Trying Something New by Making Bladewing Like New! Normally, this series takes the Uncommonder, looks at how to build a precon-style decklist based on the data available from EDHREC, and with that data I’ll come up with two or three different quirky strategies the deck could employ. The overall goal is to surprise folks at the table. Most of the time, these commanders appear to do something specific and narrow, and we want to boost some creativity out into the community and encourage off-the-wall builds. For Bladewing, the Risen, I noticed that a large number of new cards from recent sets do not appear on his EDHREC page, which means the usual precon-style decklist could feel out of date. With that in mind, the main goal of today’s article is to take this older Uncommonder and upgrade it into a more modern variation with tons of new, powerful cards from the most recent sets. Let’s talk about Bladewing. For starters, the big Rakdos Dragon has a monstrous mana cost, sitting at seven mana. Looking at the base stats of a flying 4/4 body, that does not seem very balanced in our favor. Luckily, Bladewing has two other powerful abilities that explain the large mana cost. 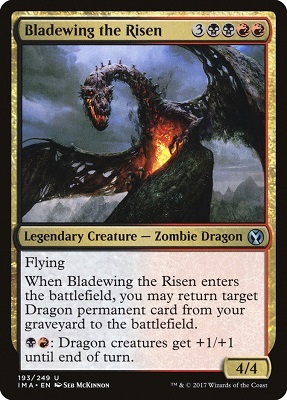 When Bladewing enters the battlefield, we learn why he’s earned the title “the Risen,” because he brings back another Dragon permanent from the graveyard straight into play. In my previous article, featuring Whisper, Blood Liturgist, we spoke at length about the power of bringing creatures back from the graveyard untapped, so I want to point out that the Risen permanent does indeed come back untapped and ready to attack. Last but not least, Bladewing empowers the rest of the Dragon horde by giving them a +1/+1 boost. I must admit, this boost can be mana-intensive, but it’s still something we can drop all of our available mana into for a big hit. Naturally, Bladewing is primed for Dragon tribal, so we’ll now look to all those recent sets for inspiration. Dominaria has some excellent Dragon cards, but it’s not the only buff that Dragon decks have seen over the past year. Commander 2017 saw the printing of The Ur-Dragon and some amazing cards for the tribe. 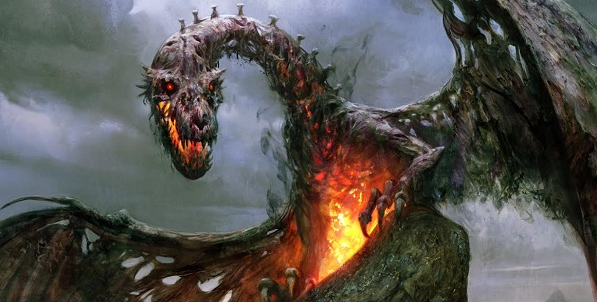 We saw Glorybringer devastate the Standard format, and both Dominaria and Core Set 2019 have no shortage of Dragons to boost decks just like this one! Of course, we cannot forget the plane of Tarkir gave us some new Elder Dragons along with new broods. We always look at the EDHREC page for the commander first, to see how people are already building them. For Bladewing, I am very happy to see Final Parting listed under “New Cards.” It makes sense to want to fill the graveyard up with Dragons and also get a card for our hand, to continue our master plan. Dragons are notorious for their many features, including their large mana costs, so cards like Urza’s Incubator, Dragonlord’s Servant, and Dragonspeaker Shaman will help us cast more of them. Since we want to cast as many Dragons as we can manage, we also want to get additional value out of them. Dragon Tempest, Scourge of Valkas, and Warstorm Surge all allow us to chip down the life totals of our opponents – or else whittle down their armies – by dealing damage when Dragons enter the battlefield. Speaking of which, Utvara Hellkite can get crazy in this kind of deck. The last bit of tech that I find to be the most fun in the precon-style deck is Conjurer’s Closet and Panharmonicon. Obviously Bladewing’s ability is an “enter the battlefield” effect (or “ETB” effect) which synergizes with both artifacts. However, the reality is that there are actually quite a few ETB effects on the Dragons in our deck, and constantly triggering those effects will become very powerful. While I was happy to see Final Parting in the “New Cards” category of the Bladewing EDHREC.com page, I was surprised to see that quite a few cards from Core Set 2019 did not make it to the page yet. I am assuming that folks haven’t updated their old lists online, and that players have not submitted new Bladewing decks in recent weeks. That is understandable, since Bladewing is not the most popular Rakdos or Dragon commander, only leading 117 decks so far. But overall, that is good news, because that means we get to break ground and look at the newest cards from the set that might boost these decks! One of the coolest cards for Dragon decks from Core Set 2019 must be Lathliss, Dragon Queen. We are already bringing Dragons back from the graveyard, so they are all going to trigger Lathliss’s ETB effect and make us more Dragons. Additionally, over the past few years, one of the biggest complaints I have heard people make in regard to Magic: the Gathering is how hard it can be to deal with planeswalkers. When Sarkhan’s Unsealing was revealed, I got very excited to see “any target” and “planeswalker” specified on the card text. Speaking of Sarkhan, we saw two new iterations of him printed in M19, one as an Intro Deck planeswalker and another, more powerful version within the set itself. The in-set version, Sarkhan, Fireblood seems like a great addition, giving us mana to cast our big flying lizards. I like Demanding Dragon as a flying 5/5 for five mana that forces an opponent to make a tough choice. Rise from the Grave is not a new card, but it was reprinted in M19, and it gives us the option to take a creature from someone else’s graveyard instead of just our own. Speaking of taking things from graveyards, another exciting card is Desecrated Tomb. Since Bladewing brings things back, especially with our Conjurer’s Closet, I think creating a small flight of bat tokens will be great added value. At the very least, they’ll work as chump blockers, so we can constantly send our huge Dragon horde flying at our opponents with less fear of crack-back attacks. The last card that I like for Dragons of all kinds from M19 is Dragon’s Hoard. Like Lathliss, this card cares about Dragons entering the battlefield, not just being cast, so we’ll get gold counters often, which will help us draw cards. (Black doesn’t usually hurt for card draw, but it’s always nice to have extra!) Finally, I’ll also suggest a card that isn’t meant for Dragon decks specifically, but that does fit for any Rakdos deck: Meteor Golem. Black and red have issues dealing with enchantments, and even black struggles to eliminate artifacts. Meteor Golem helps with those problem permanents, and goes into the same line of conversation as cards like Unstable Obelisk (which I’ve also included in this decklist). NOTE: I realized after making the list that Path of Ancestry was also not in the EDHREC page for Bladewing, the Risen, and that surprised me even more than the lack of M19 cards! While part of our strategy will be getting our Dragons into our graveyard to recur them with Bladewing, there will be times where we must hardcast them from our hand, so there’s no reason not to include Path of Ancestry. This is an old, silver commander, but we can still give it a thoroughly modernized Dragon tribal update! What did you think of this week’s format for the series? Should we use this kind of theorycrafting of bringing old Uncommonders into the modern age while using the quirky builds for the new Dominaria legendary creatures? Or should we just bring the jank at every turn? Let me know in the comments down below. Also, just to remind you, the next article will be about a Dominaria Uncommonder. Which one, you ask? Well, you can help me decide! Join me on Discord to help me come up with four options and then follow me on Twitter and look out for the poll, where you can vote for whichever option you’d like to see next! Until next time, keep casting those big (draconic) bombs! Peace.